The next upcoming Epiphany is on Monday January 6th, 2020. January 6 celebrates the Epiphany Christian holiday. It is also known as Three Kings' Day to remember the three wise men who visited Jesus as a baby. It is not a U.S. federal holiday, although it is a public holiday in the U.S. Virgin Islands. This Christian holiday celebrates as a feast day honoring Jesus Christ, God's son, in human form, the visit from the Magi to baby Jesus, and Jesus' physical revealing to the Gentiles. In the U.S. Virgin Islands, it is celebrated with food, music, parades, and parties. The emphasis is maintaining heritage and culture. In Sunday school classes, children make a star representing the star that led the wise men to Jesus in Bethlehem. 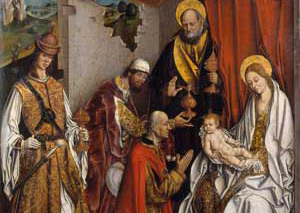 Epiphany has been celebrated before the Christmas holiday was established since the end of the second century. As one of the oldest Christian feasts, the Protestant and Roman Catholic emphasize the Magi visit to baby Jesus where the Eastern Orthodox church emphasizes the baptism of Jesus. The holiday is also known as the Twelfth Day, Twelfth Night, or Feast of Epiphany.